I mean, I like the idea of a region that is quite empty, rural and suddenly there is money, enough money and the distinct will to create lands of dreams to attract people, incredible things like an island palm, a ski slope in the middle of the desert, world’s biggest and luxurious malls, the world’s tallest building (next to all these other 300 high-rise skyscrapers) and – you probably guessed it – some of the planet’s top class golf courses! The Emirates have a long history but the future looked dark for some of them. Well they have oil, yes, but for how long, what will come after and who would invest in such country where there’s desert all over the place, temperatures of up to 60°C in summertime, 85% foreigners and only some fancy forward looking phantasies? One may argue that everything is built on sand…. and it would be totally correct! But it would be narrow-minded as well, because the monarchs, the sheiks in this region have one thing in common; they’d like to stand out and fight for attention, for their right to show the world that there is such thing like a strong arabian will to make some things happen that nobody ever dreamt of, besides the sheiks themselves or the people that consult them. The result is clearly visible if you drive down the Sheik Zayed Road in Dubai, from the ancient part in the north-east to the modern part in the south-west. You pass dozens of newly created quarters, hundreds of skyscrapers, the Burj Khalifa as the tallest building (by far) in the world among them, you pass the only 7-star hotel complex, extraordinary resorts, shiny business centres, fancy restaurants, most expensive cars, the niciest beach clubs, decadent marinas with incredible yachts and some astonishing golf courses as well. Back to the initial question: what course to play?! After the years Dubai managed to create some masterpieces, or in other words, Sheik Al-Maktoum managed to get some golf artists like Nick Faldo, Ernie Els, Colin Montgomerie and other famous names to create a couple of undoubtedly breath-taking courses – in the middle of a desert! That may be one of the stangest things to realise. 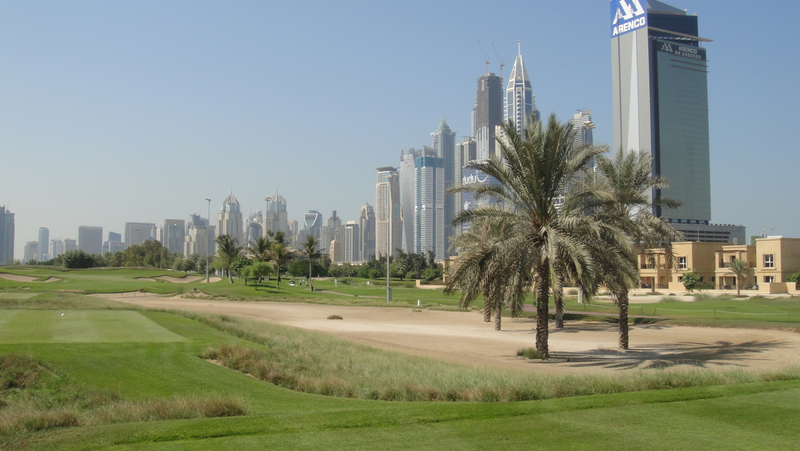 There is lots of sand available but for golf one would need grass and humidity in common sense, both rarely seen in the Emirates (at least if you compare it to the British Isles: too much humidity here and vast landscapes of green grass). But like in other occasions you realise mankind is capable of creating incredible things. And these golf courses in the desert definitely belong into this category! People invented new strain of grass that can cope with salt water to avoid using drinking water for sprinkling instead! How cool is that? Environmental friendy golf courses in the desert; a good thinking if you ask me! 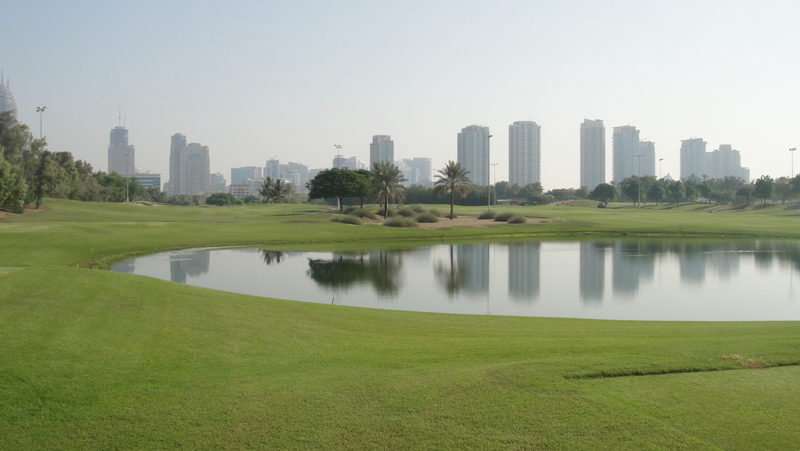 The Earth Course at Jumeirah Golf Estates is supposed to be a real beauty but as the 2012 DP World Tour Championship is approaching and about to take place exactly here, it was closed for the preparation works. 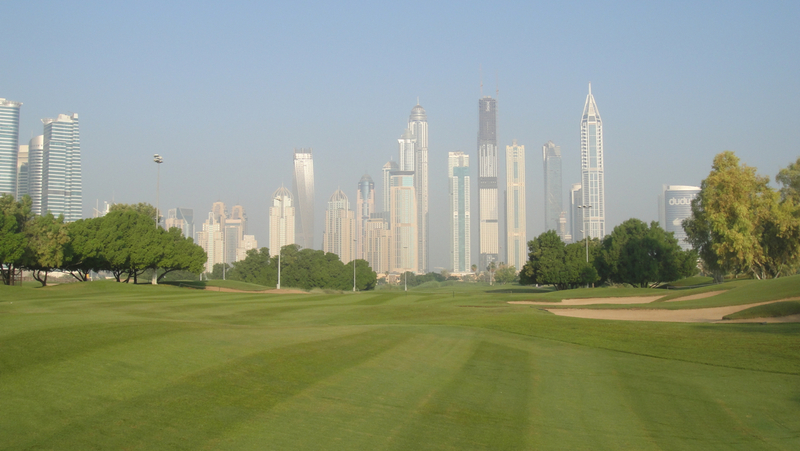 My choice was a bit traditional: I opted for the oldest and most famous club in Dubai but for the newer course: The Nick Faldo course, also known as the ‘The Wadi’, at the prestigious Emirates Golf Club Dubai – just a stone-throw from Dubai Marina, Jumeirah Palm and Burj al Arab. 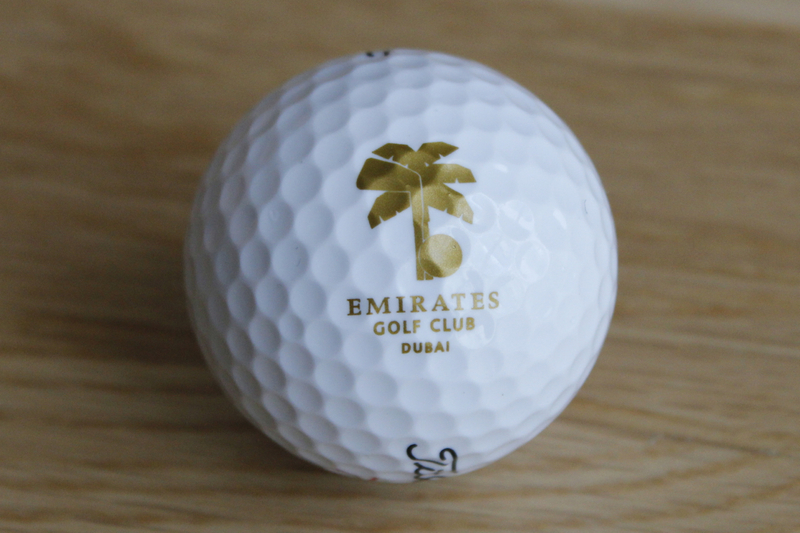 I got a 7:15 tee time at my spontaneous visit and was grouped together with three members, two Kiwis and a Canadian, all long-time Dubai residents as they told me. The course itself is a tricky one I have to admit. Lots of bunkers in play, lots of water, intimidating drives needed over some ponds that looked more like the North Sea rather than water hazards on golf courses to me, and in addition small, fast and slopy greens. It was early, I was excited but nervous, an unknown course with rental clubs and it got hot quite quickly. So it wasn’t the best circumstances to play a perfect round but boy had I fun! Do you know that feeling: you play one double-bogey after the other (very few pars and some decent bogeys as well), your swing feels somehow strange and normally you would hate that day from the beginning, but hey, I was standing there, on a Thursday, in Dubai, playing golf in 40°C, wearing shorts in October, playing a famous course that I always dreamt of playing, looking at the stunning scenery, thinking to myself: forget the score mate, enjoy every single second, every shot, every green and every putt (even if you need 3 on one green…) and I did exactly that. And imagine, I enjoyed it pretty much!! It is a strange feeling, wandering (or driving) on beautifully manicured fairways, knowing that it was a sand desert here originally and that some wise men managed to create a golf masterpiece out of nothing. Grass, water, trees: all sort of things you wouldn’t expect in a desert in the first place if you are new to golf, but when you see this, it blows your mind.